It’s always interesting when we are asked where we’re from. The island of Tanda Malaika? The cool thing about our home is that our home itself and the comforts of it are always there – just like yours, it’s just that our yard changes all the time. Our home is where ever the anchor drops. After leaving Rose Island we set out to see what we could see. We have passed many little islands with abandoned broken down buildings that have been damaged in previous hurricanes. Mycah, the goof ball, fell asleep in Jude’s arms on this trip. We came across a gorgeous little island that seemed to call to us, so we dropped anchor and as we did we saw turtles surface to check out the new visitors, and eagle rays dancing in the surf ahead of us. Mommy and Bernadine grabbed their bags to fill with shells and we all set out for shore to explore. Usually my mom moves old dry debris around with a stick to see what treasures lay beneath, but for some reason on this beach she also wanted to see what lay beneath the large rocks on the beach, so Jude and Jonathan spent some time flipping rocks for her. She collected so many shells!! Emma found quite the stash too, and Bernadine returned with a huge collection of sea biscuits. Jude has been learning how to splice line, and every time she finds old line on the beaches, she spend hours untangling it and practices splicing. She’s doing a great job. What an absolutely beautiful, peaceful place this is! When we returned to the boat, I grilled some lamb chops on the braai (BBQ) and served it with a nice big pasta salad I’d made earlier in the day. 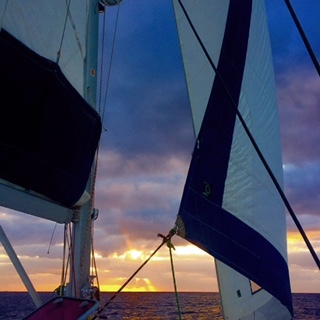 We all sat at the stern and watched the sun set on yet another amazing day on the water. Later in the evening Mycah, Jude and Danny sang and played the guitar and uke to ‘Southern Cross’ while everyone fell asleep to the beautiful lullaby.